ASUS has refreshed a few of its well known gaming laptops at the ongoing Consumer Electronics Show (CES) 2019 with some interesting design and spec changes. First up is the ASUS ROG Mothership 17-inch gaming “laptop”. 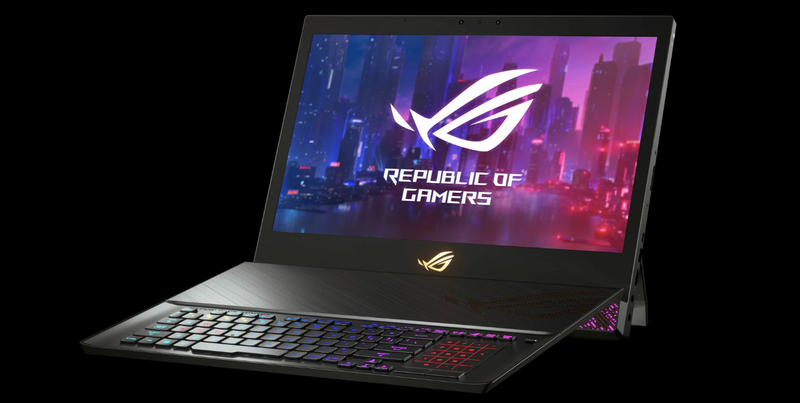 But the ROG Mothership is more than a laptop because it is, in fact, more of an all-in-one PC in the body of a gaming notebook. It comes with a detachable Surface like display and keyboard but differs itself from Microsoft’s offering in the way that its kickstand comes out automatically at the push of a button. Weighing in at a hefty 4.7kg, ROG Mothership is designed to travel but requires you to park it for use, that is if you want to fully enjoy the experience. It is one of the first gaming laptops to make use of the new Nvidia GeForce RTX 2080 GPU coupled with Intel’s Core i9-8950HK CPU, which is overclocked up to 4.78GHz right out-of-the-box. This should provide users with plenty of power and the 1080p display with 144Hz refresh rate and 3ms response time and NVIDIA’s G-SYNC should deliver solid gaming performance. ASUS ROG Mothership can be customised with up to 64GB of RAM and three 512GB NVMe SSDs in a Raid 0 array. Its detachable keyboard connects to it via Wi-Fi as well as a cable rather than Bluetooth and can be folded for added comfort. ASUS hasn’t said anything regarding its pricing or release date yet. Apart from this, ASUS also refreshed its entry-level gaming laptop line with AMD’s new 3000-series Ryzen CPUs and Radeon discrete graphics. Both ASUS TUF Gaming FX505DY (15-inch) and FX705DY (17-inch) are powered by AMD Ryzen 5 3550H CPU and Radeon RX 560X GPU. Both the laptops feature full-HD IPS displays and support FreeSync (AMD’s variable-refresh technology). However, the 15-inch FX505DY has a better refresh range (48-120Hz) than the 17-inch FX705DY model (40-60Hz). They can be customised with up to 32GB RAM and 512GB SSD and 1TB hybrid storage. ASUS will start shipping the laptops by March-end, but the pricing details are still unknown.